Now I am sure you have all seen in every magazine and on some decor blogs that antlers and gazelle statues are all the rage. They definitely fit into what I would call the trendy category. I've seen them anywhere from $19.99 to $159.00. Now I am intrigued by the gazell statues, and thought I might want to join the "club". If it's trendy and I'm not too sure if it is "me" or not, then I need to stay around the $19.99 budget. Nothing to my liking until the other day on the clearance aisle at Ross. I think this will work. There are a few chips on the bottom that I can fix and I can change the color too. Super bargain for $5.00. The majority of the ones I have seen in magazines and on fellow bloggers are all gold, and as you know, I am on a gold kick. So I got out my trusty 24K gold spray paint. I taped a plastic bag around the bottom and sealed the edges good with frog tape. Not bad, I think it looks 100% better. Just the perfect size for this little chest and creates a fun vignette. I found this fabulous ceramic tray on sale at Target for $7.58 on their clearance aisle too. I love the size. I like it, I think it is a fun addition to the room. It's always fun to experiment with a few new ideas don't you think? The architecture of my house is very simple with no moldings, curves or any distinguishing features. My furnishings are very traditional. Now the two work together since my background is straight forward and simple. I love traditional, but it can begin to look a little dated and stuffy, so I have been adding a few contemporary elements lately by way of a few accessories, but mostly updated fabrics and colors. I just want to give my home a fresh look. However, I don't want to totally abandon my roots, so I am moving cautiously. If you are going to test out a trend, be sure to do it with things that don't bust the budget. All the new contemporary pillows are from Hobby Lobby for around $5 each at 1/2 price and now the gazelle for $5. If I decide this isn't a look I want to keep, I didn't break the bank. Sound advice, and good thriftiness in getting a look w/o too much $ committment. I can't get over the before and after. Your paint change made it look like an expensive piece! Great job! This trend never appealed to me so I'll pass but do like your make over - it looks good! Such a great tip, Marty! 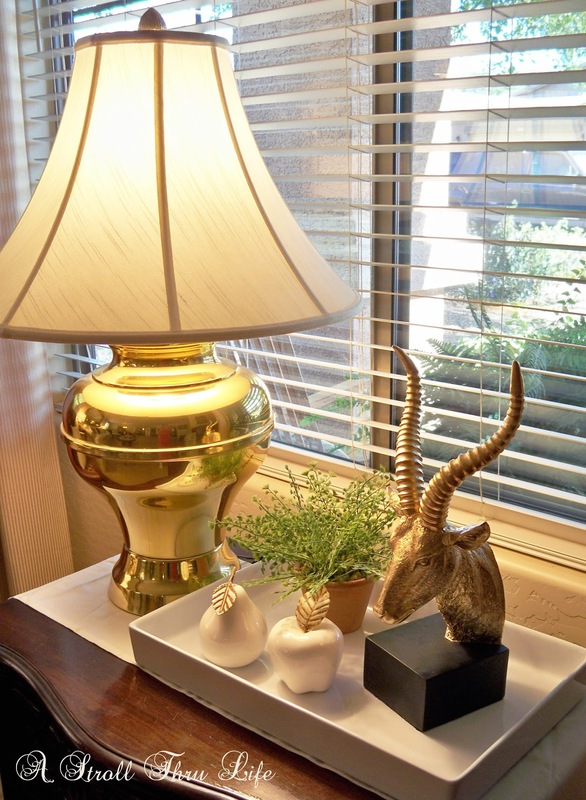 I think you got a great deal for $5.00 on your gazelle and it really suits your home in the gold. I think that your gold paint is an improvement. I understand your thoughts on traditional and trying to look current at the same time. I am a traditional girl though. I admire others mix and eclectic styles...but on a daily basis I love traditional and early Kentucky antiques. Who knows, I might do something wild. I bought an orange outdoor rug which is kind of crazy for me. Ha! Unfortunately, trendy things usually don't come up for sale that often . . . ONLY when they're not trendy anymore! And then you decor is "behind"! LOL! I like that piece better gold and you have added "the latest" without breaking the bank! 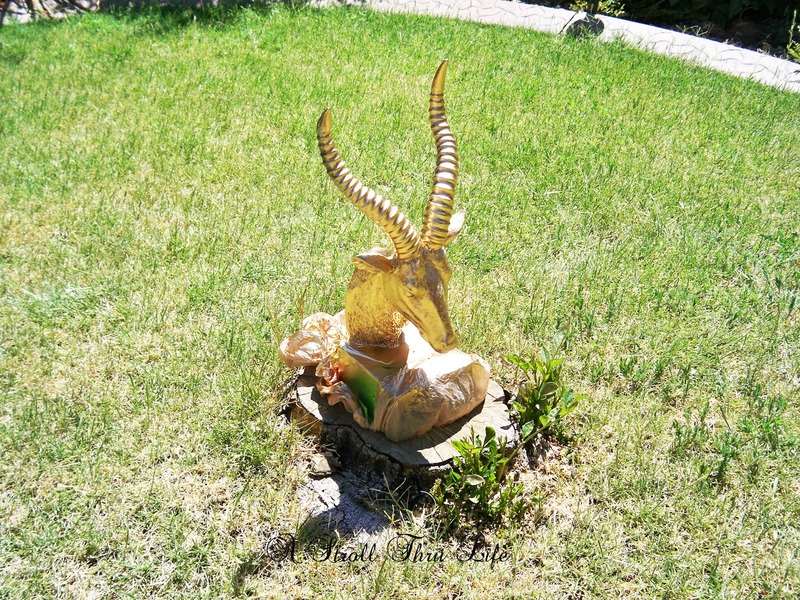 Oh my goodness...I love the gazelle in GOLD! I think gold is making a huge comeback. I always loved it but for the past 10 years or so have been more on a silver brushed nickle kick. 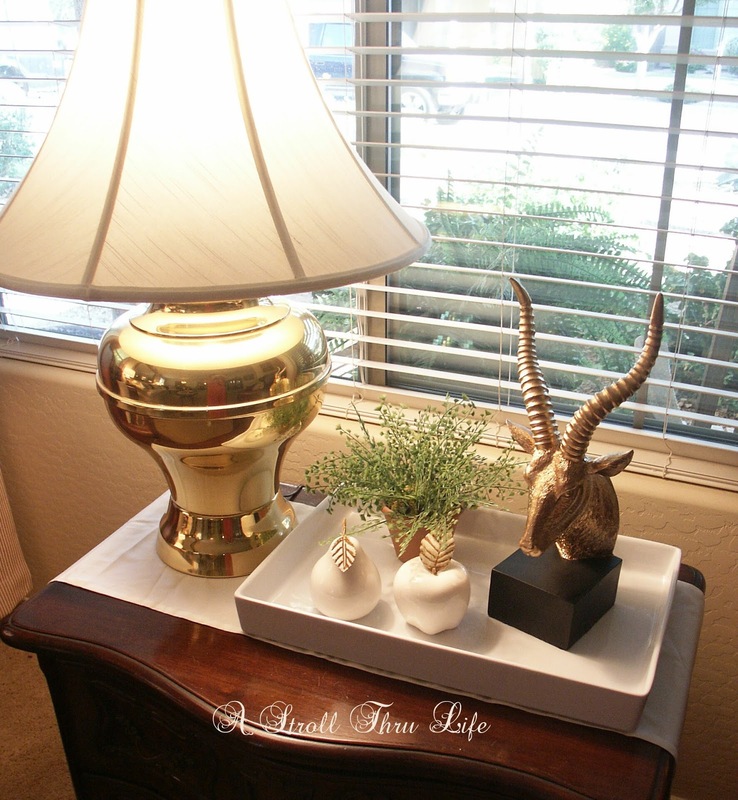 I just did my guest bedroom over with pops of gold and I have to say the gold is classic and I love it! 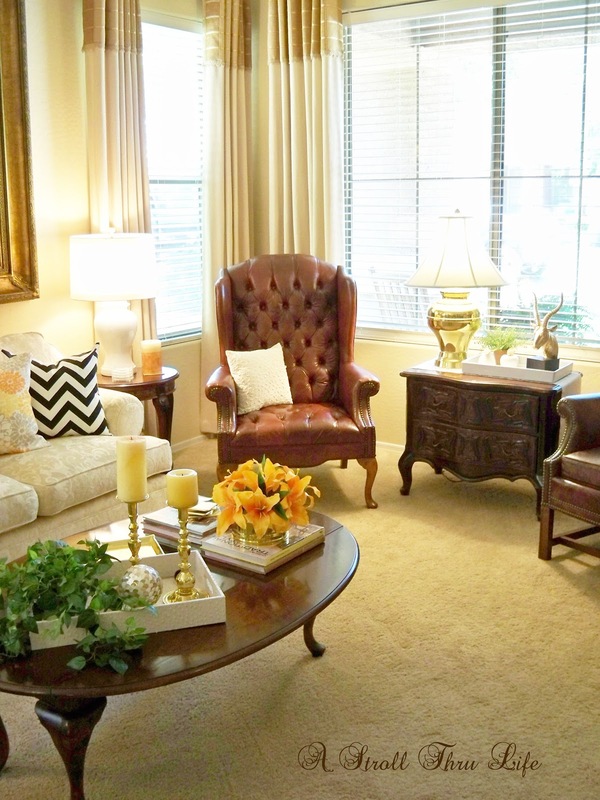 Your living room has a completely classic look which with a few trendy items added in now and then, it will never go out of style!! Great idea! I like the gazelle better with the gold too, He looks very expensive now. I like you way of thinking, I am a traditional girl as well. I think you've added to perfect amount of trendiness to your traditional style Marty. The gazelle is great & similar to the one my daughter gave me for Christmas! Great advice Marty. We so often get caught up in what every one else is doing. It's so easy when you blog - like cloches. I never did find one that I was willing to pay the asking price for, but realize now, I really didn't need it. 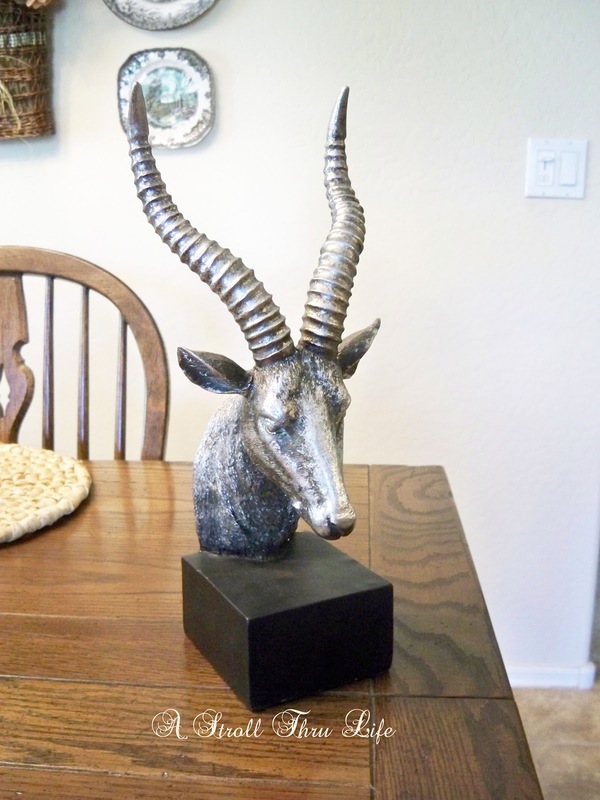 Your gazelle looks just perfect in your home. I think you got a great bargain and his makeover makes him fit right in. Great deal Marty, I really like your gazelle. And your advise is spot on. Around our parts, there are stuffed deer head with large antlers in nearly every home. That's probably why I haven't taken to the antler craze. Marty - what a great find! They are definitely trendy, but I LOVE that you found one for a "steal" and made it your own with paint!! Such a great tip, Marty! Thanks for sharing wonderful information, it is really nice information. 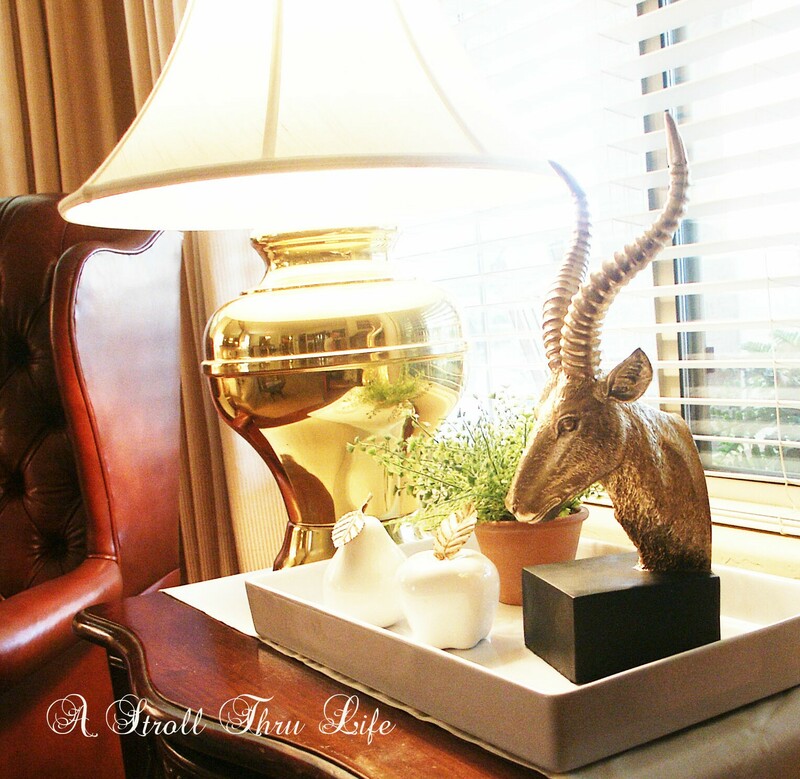 As usual, your tips are so helpful, and painting the gazelle gold is the perfect touch of 'class' to your vignette! Love it, Marty! 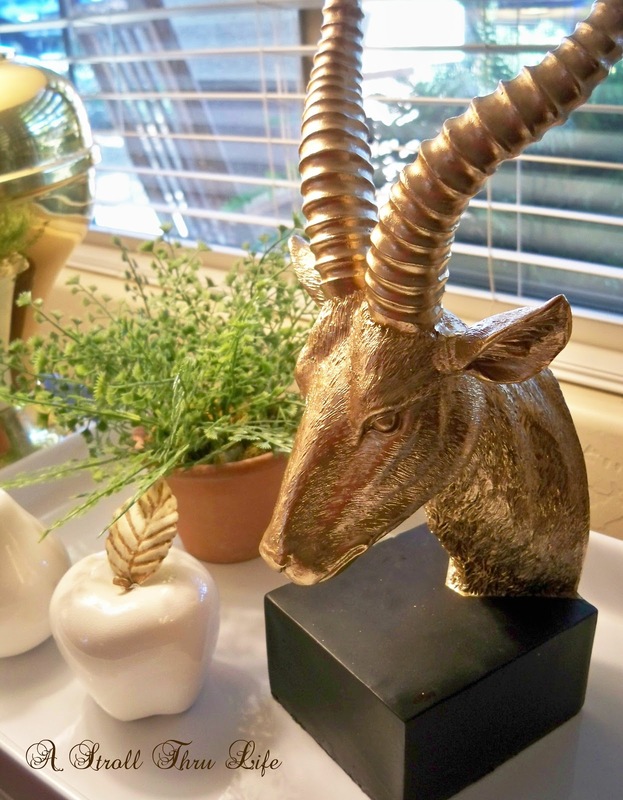 You amaze me Marty, as you always find FABULOUS things and what you are looking for exactly at the best prices... and not only that, but you are so talented to finish this beautiful gazelle into a perfect gold color as your little heart desires! Marty, I am doing the same thing - trying to breathe new life into my traditional living room which looks a little too dated. Love the Gazelle! I too am a huge fan of spray paint. Looks great, Marty! It adds greatly to your decor. I agree with having limited budget for trendy stuff marty but my, what a deal! love that you sprayed it gold! Marty, I am in such need to redo my little cottage, so I am hanging on every bit of advise. Love your gazelle and the touch of gold. How do you come up with these ideas??? Oh thanks, but I just copy cat things I see on in magazines, pinterest and on my favorite blogs. I like to do it on a budget, so usually I have to thrift shop or do a makeover, but then that makes it look like me. There is tons fo inspiration out there, so just copy anything you like. Oh I like that a lot! It turned out so nice- love the new color- much better! Good advice Marty! I agree that if I'm adding trendy to my décor then it has to be inexpensive. I like spending the high dollars on more traditional or on items that I know I won't tire of quickly. 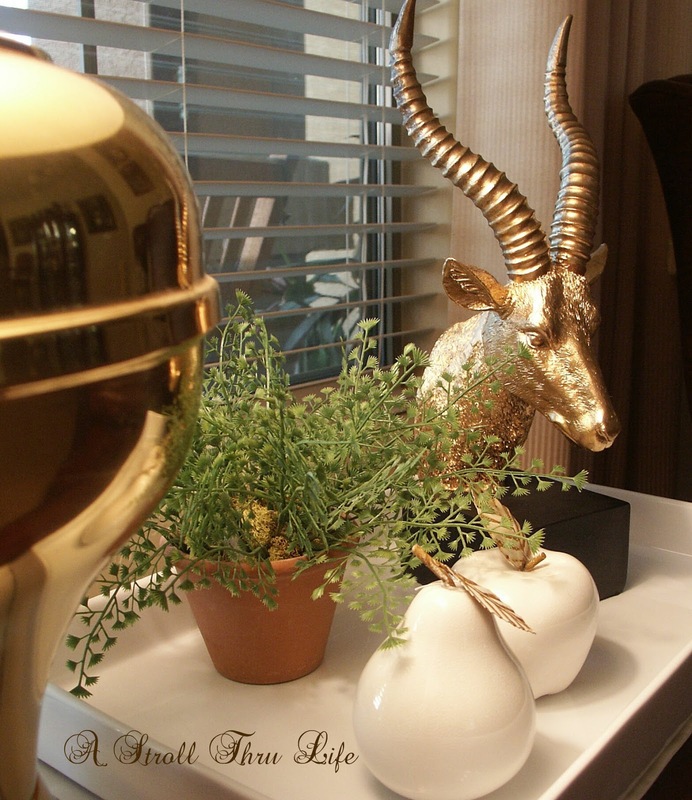 Love the gazelle and painted gold he looks wonderful in your room. It looks very high end! You're a very smart decorator and thanks for the advice. I love your living room! I think trying out trends in small portions is alright. I tend to stick with tradition too, and am nervous to try trends. One I know I'm not crazy about is the Chevron everyone is so crazy about. Marty, I agree with doing the trendy on a budget. If I don't like it I don't want to feel guilty that I spend a small fortune! I would have passed up the Gazelle, but you had a vision and it looks great! Might I add that I love your apple and pear with the gold leaf. I'm thinking some faux fruit, paint it with a pearly finish and paint the leaf gold, hmm . . . What do you think? Oh I think the pearly finish would be fabulous and I am all for anything gold right now. My new thing. I really like your gazelle, and especially like the new color! I really don't care for the antlers that so many people are hanging on their walls or plopping into a coffee table vignette -- seems kind of gross to me. Your piece is very pretty and looks perfect on your table. I typically avoid trendy, too, except for burlap and dropcloths......lol! Nothing much is more fun then getting out the spray paint and changing something to suit your own taste. :) I love it! i love your new accessories it looks fab on your living room..
Oh it is truly adds a fun new element to the space! Your gazelle is such a great find - I love them too but like you am not going to spend $50+ for one (which is how much all of the ones that I've come across have been). At $5 I would have snatched it up too!! You are so right about trends; an accent trend here and there works for me too. I like to change things around when I get the urge, so everything must be multi-functional, or at least multi-decorative and usable in most any room. Cute gazelle. What?!?! I can't believe you picked that up for $5...I love Ross! Brilliant decision to paint him gold, too. Love it, Marty. Thanks for linking up with us at Best of the Nest!